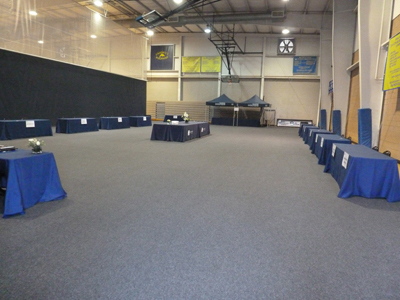 Before you hold a Special Event on your hardwood or polyurethane floor, protect it from damage with a gym floor cover. 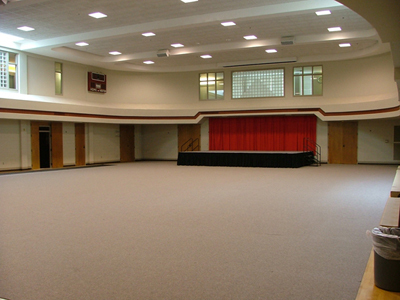 It's easy to convert any space to a multipurpose venue with CarpetDeck™, Protect your gym floor during special events, concerts, or graduations with these easily assembled and attractive floor covers - without breaking your budget! CarpetDeck™ protects your valuable wood floors from damage during special events and transforms the look and feel of your space. CarpetDeck™ is supplied in 39.37" x 78.74" Tiles. The modular tiles feature a multi-layer construction that combines an elegant carpet top with a thick, protective PVC backing. CarpetDeck™ protective modular tiles each cover approximately 21 sq. ft., which allows them to be quickly set up, but are lightweight enough to be easily handled by one person. Tiles are simply set down and slid into place, and require no tools or special equipment for assembly. CD is available in 3 attractive gym floor cover colors. 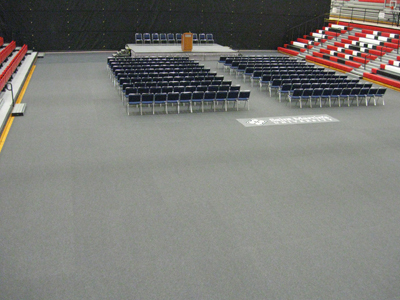 Once in place, CarpetDeck provides an elegant and seamless protective floor for all kinds of events, including graduations, concerts, fundraisers, and trade shows. CD tiles stack neatly and compactly for storage. Carpet tiles reduce noise while protecting your floor. We offer a specially-designed CarpetDeck Transport Cart (CD-TC) to speed installation and to provide a mobile storage unit for tiles while not in use. Holds up to 70 tiles. Mixed tiles can provide for patterns, versatile zoning, pathways, or choices of colors for various events. CarpetDeck™: will extend the life of your hardwood or poured-urethane athletic flooring and offers a more durable and affordable alternative to traditional rolled-vinyl gym floor protection system. > Economical and attractive gym floor protection. > Extremely lightweight (13.65 lbs each), durable, and tear resistant. > Easy to clean, highly stain-resistant. 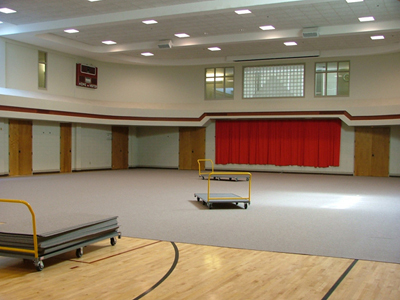 CarpetDeck™ is the perfect way to protect your valuable gym floor during events like graduations, dances, proms, or assemblies and prevent the damage caused by chairs or tables. CarpetDeck™ is an upscale alternative to traditional floor tarps that is made from 75% recycled materials and is virtually stain-proof. After the event, simply vacuum or spot-clean, then stack up the tiles and store the cart in a closet or out of the way storage room. Custom-flocked logos are also available upon request (for additional fee)! These are not screen-painted, we actually use a process that applies colored flocking directly to the carpeted surface for durability and great looks. The CarpetDeck™ tiles are $49.50 per tile. With your city, zip code, and the quantity you think would work the best for you, we can give you definite delivered pricing.